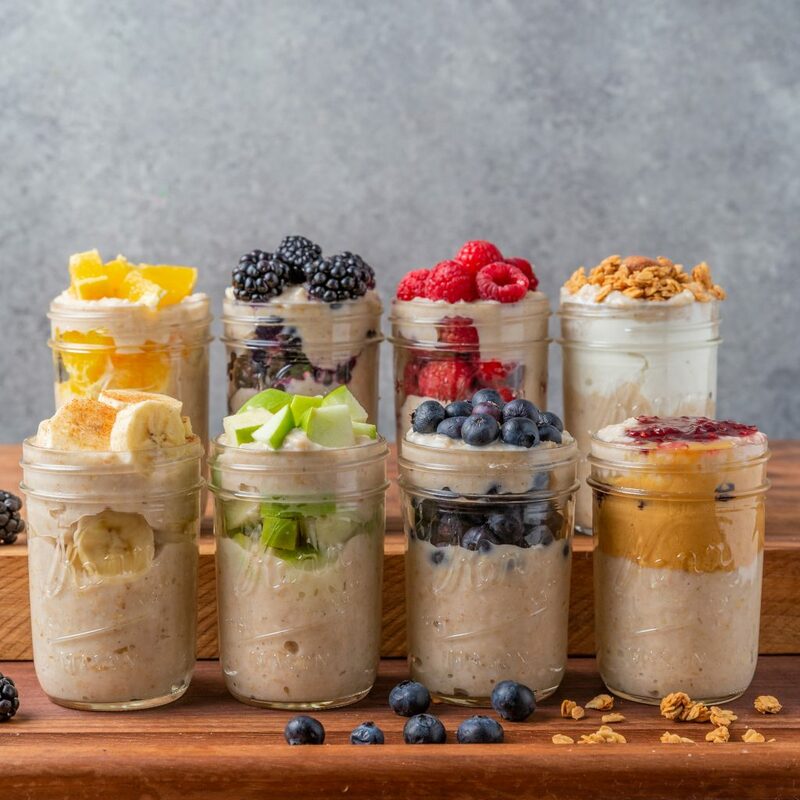 Oatmeal in a jar is the meal prep recipe that will change your morning routine. 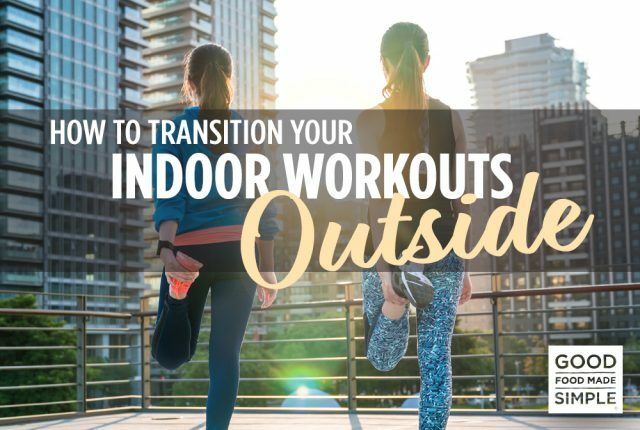 All it takes is 5 minutes of prep work the night before to ensure that you have an easy and energizing breakfast as you run out the door. A perfect grab-n-go idea! We are all about quick, easy, on-the-go meals that will leave you feeling energized and satisfied. 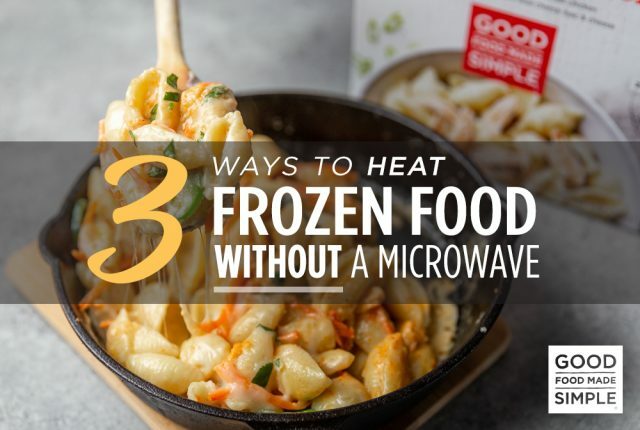 Plus, we want them to have great flavor! 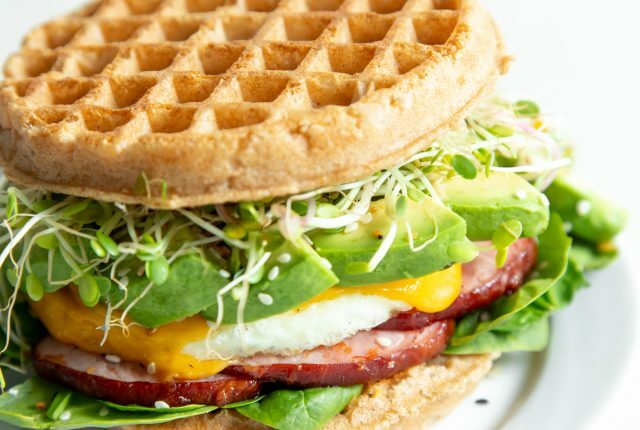 Have you seen what’s going on with our breakfast burritos? Mouthwatering! But, sometimes we want something sweet to start the day. Yes, we could opt for waffles or pancake puffs, but when we want something sweet and need it fast our trusty Organic Unsweetened Oatmeal always steps into play! 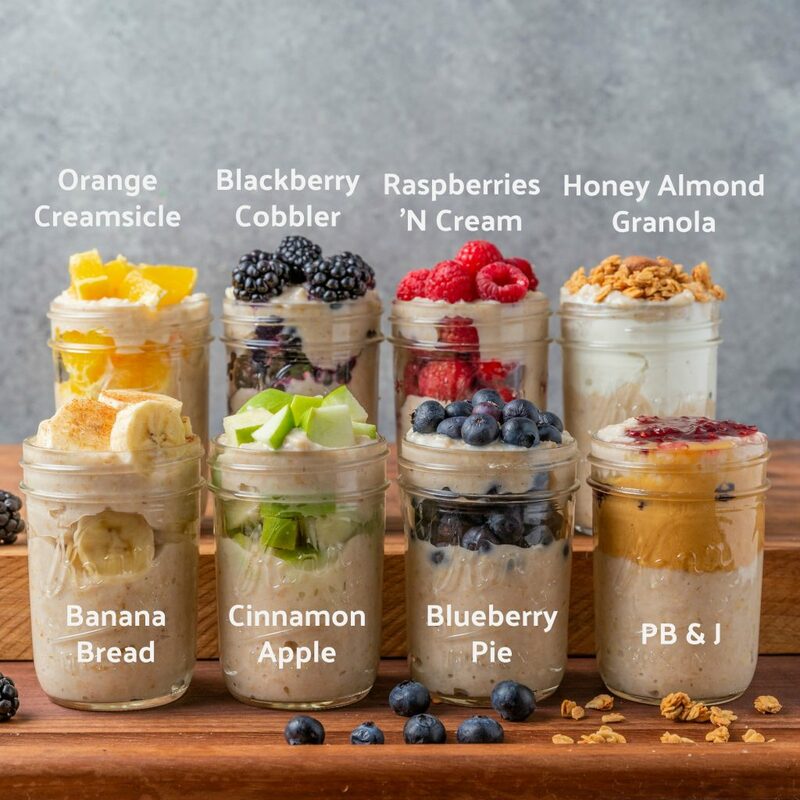 Some days we just want to savor the unsweetened nutty texture of the oatmeal, other days we want to dress it up one of these 8 ways! No matter how you do it, our oatmeal is great for a quick morning meal and even better for meal prep! Don’t these flavors make your mouth water? So, are you ready to get started? We thoughts so. 1.Decide how many jars you want to make. You can opt for 1 jar for the next day, 2-3 for a few breakfasts during the week, or go for all 8 like we did! Our family loves to all grab these on the way out the door. 2. Decide what flavor combinations you want to make. The possibilities are endless here, so let your creative mind run wild! Oh, and if you happen to make any of these flavors or one of your own, tag us on social media so we can share your creation! 3. Grab your oatmeal. You will need 1 box per jar. 4. Pick up the items needed for your add-in’s. Or, just wing it and use what’s in your house! 5. Layer 1/2 of your oatmeal, 1/2 of your add-ins, the second half of your oatmeal, and finish off with more add-ins. 6. Seal and put in the refrigerator. Your oats will last up to 5 days depending on what you use for add-ins. 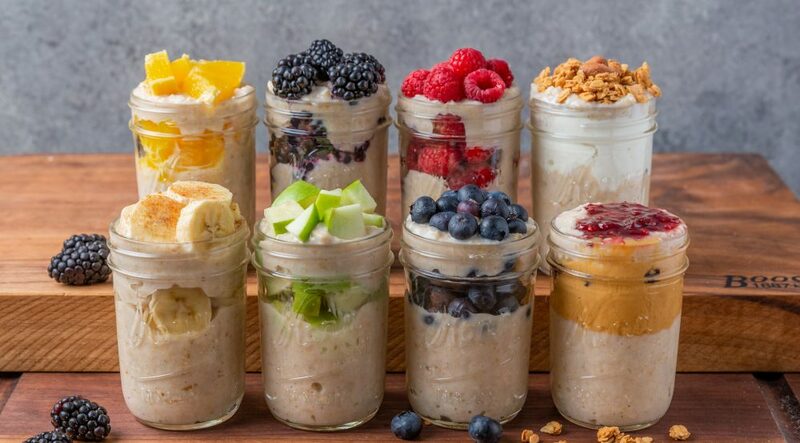 Oatmeal in a jar is the meal prep recipe that will your morning routine. All it takes is 5 minutes of prep work the night before to ensure that you have an easy and energizing breakfast as you run out the door. A perfect grab-n-go idea! Mix together your oatmeal, orange juice, 1/2 of your cottage cheese, sweetener, vanilla extract, and chia seeds. 2. Put half into the jar. 3. Layer in 1/2 of your orange. 4. Add the rest of your oatmeal on top of the oranges. 5. Top with remaining cottage cheese and orange slices. 6. Cover and store in the fridge. Mix together all ingredients except your blackberries. 2. Layer half of your oatmeal into the jar. 3. Add in half or your blackberries. 4. Layer in your remaining oatmeal. 5. Finish off with the rest of your blackberries. 6. Cover and store in the fridge. Mix together your oatmeal, milk, greek yogurt, vanilla, sweetener, and chia seeds. 2. Put half into the jar. 3. Layer in 1/2 of your raspberries. 4. Add the rest of your oatmeal on top of the raspberries. 5. Top with remaining raspberries. 6. Drizzle with cream. 7. Cover and store in the fridge. Mix together oatmeal, milk, chia seeds, 1 tsp honey, and slivered almonds. 2. Put into a jar. 3. Mix together Greek yogurt and remaining 1 tsp. honey. 4. Place on top of oatmeal. 5. Finish off with 2 tbsp. of granola. 6. Cover and store in the fridge. Mix together oatmeal, milk, mashed banana, brown sugar. 2. Layer half of the oatmeal into the jar followed by 1/2 of the sliced banana and 1 tbsp walnuts. 3. Repeat the layers. 4. Finish off with a sprinkle of cinnamon, if desired. 5. Cover and store in the fridge. Mix together oatmeal, milk, maple syrup, chia seeds, and 1 tsp. ground cinnamon. 2. Layer half of the oatmeal into the jar followed by 1/2 of the apple and a sprinkle of cinnamon. 3. Repeat the layers. 4. Cover and store in the fridge. Mix together your oatmeal, milk, honey, Greek yogurt, honey, salt, and cinnamon. 2. Put half into the jar. 3. Layer in 1/2 of your blueberries. 4. Add the rest of your oatmeal on top of the blueberries. 5. Top with remaining blueberries. 6. Cover and store in the fridge. Mix together oatmeal, milk, Greek yogurt, chia seeds, salt, and honey. 2. Layer half of the mixture into your jar. 3. Top with 1 tbsp each peanut butter and jelly. 4. Repeat your layers. 5. Cover and store in the fridge. *Recipes are listed for 1 jar. Please double, trip or quadruple as needed. * Any milk alternative or yogurt alternative can be used to make these dairy free or vegan. * We used white chia seeds, but you can use black.